The Electrical Building, constructed in 1892 for the World’s Columbian Exposition, included displays from General Electric and Westinghouse, and introduced the American public to alternating current and neon lights. 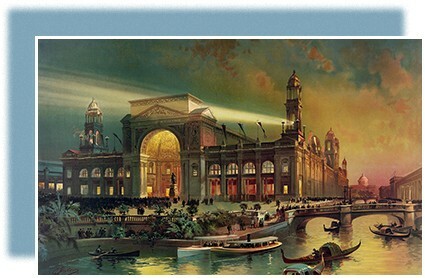 The Chicago World’s Fair, as the universal exposition was more commonly known, featured architecture, inventions, and design, serving as both a showcase for and an influence on the country’s optimism about the Industrial Age. The fair, which commemorated the four hundredth anniversary of Columbus’s journey to America, was a potent symbol of the myriad inventions that changed American life and contributed to the significant economic growth of the era, as well as the new wave of industrialization that swept the country. While businessmen capitalized upon such technological innovations, the new industrial working class faced enormous challenges. Ironically, as the World’s Fair welcomed its first visitors, the nation was spiraling downward into the worst depression of the century. Subsequent frustrations among working-class Americans laid the groundwork for the country’s first significant labor movement.